Soul Dissolution are a duo from Belgium that has had an album reviewed before in this zine and play an atmospheric form of post black metal and this is a review of their 2018 album "Stardust" which was released by Black Lion Records. Atmospheric sounding synths start off the album and also mix in with the heavier sections of the music while most of the tracks are very long and epic in length along with the solos and leads being done in a very melodic fashion and the vocals are mostly high pitched black metal screams. When the music speeds up a great amount of blast beats and tremolo picking can be heard which also gives the songs a more raw feeling while the songs also bring in a great mixture of slow, mid paced and fast parts as well as some death metal growls also being used briefly and the music also mixes in a great amount of post rock elements, there is also a brief instrumental which also introduces clean playing before returning back to a heavier direction. Soul Dissolution remains true to the atmospheric style of post black metal from their previous release, the production sounds very professional while the lyrics cover depression, apathy and inner struggle themes. 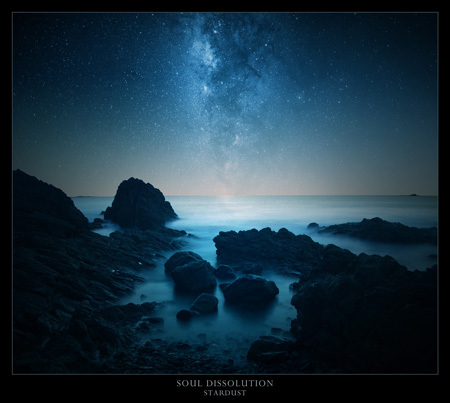 In my opinion this is another great sounding recording from Soul Dissolution and if you are a fan of atmospheric post black metal, you should check out this album. RECOMMENDED TRACKS INCLUDE "Circle of Torment" and "Far Above The Boiling Sea of Life". 8 out of 10.